This project was inspired by the mars rovers Spirit and Opportunity. 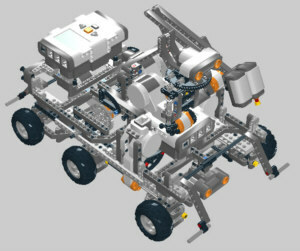 The robot should have 6 wheels, 4 of them steered. 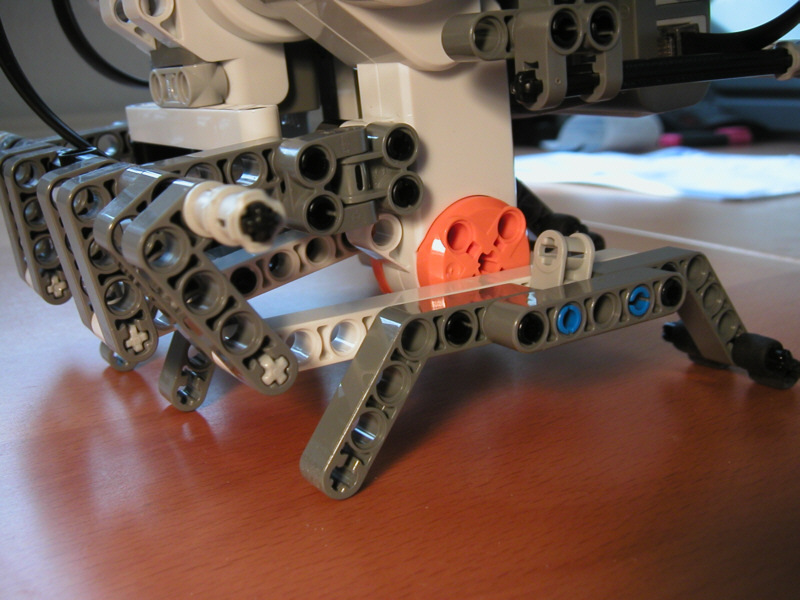 Sensors should capture the environment and a sensor arm should move out to scan objects. 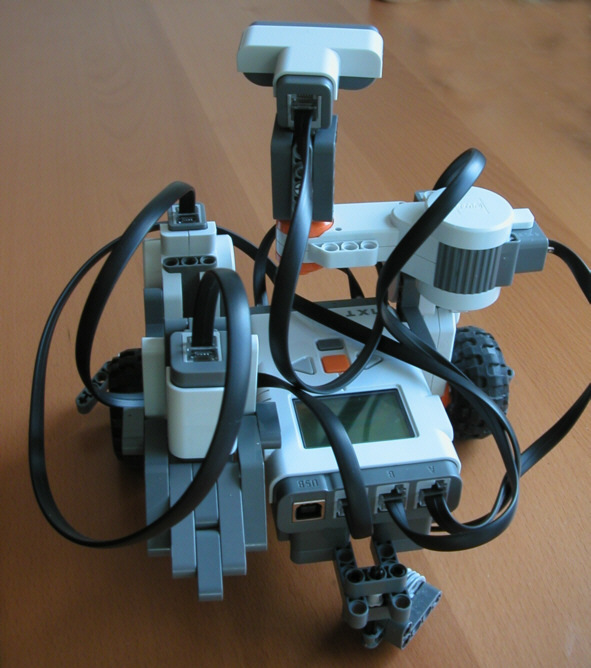 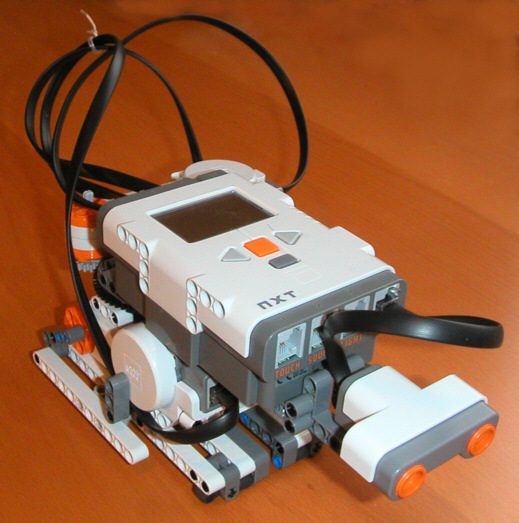 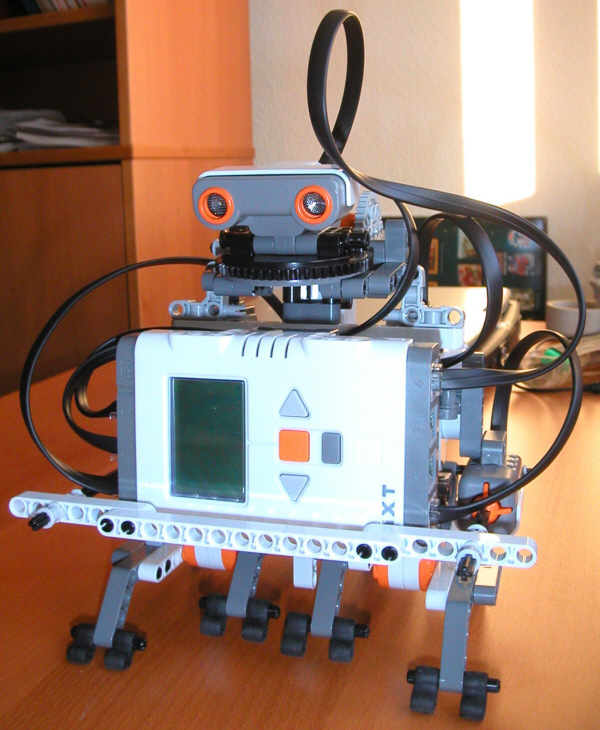 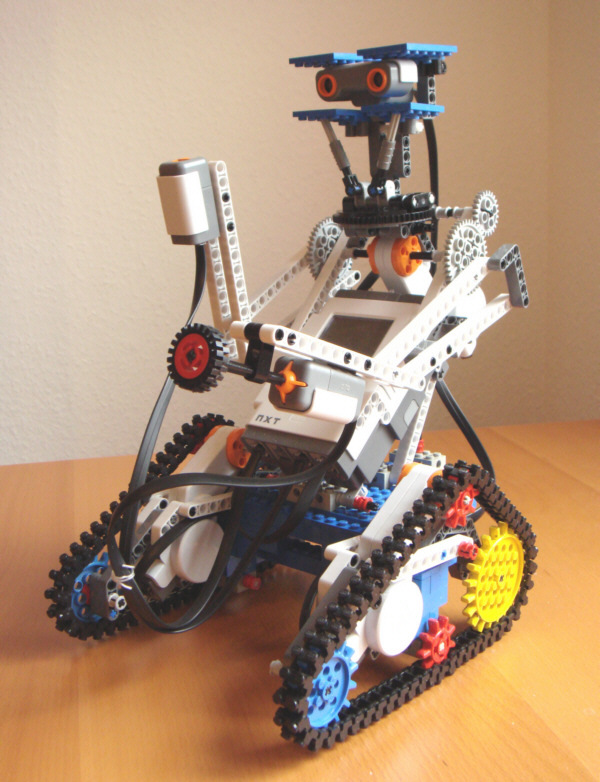 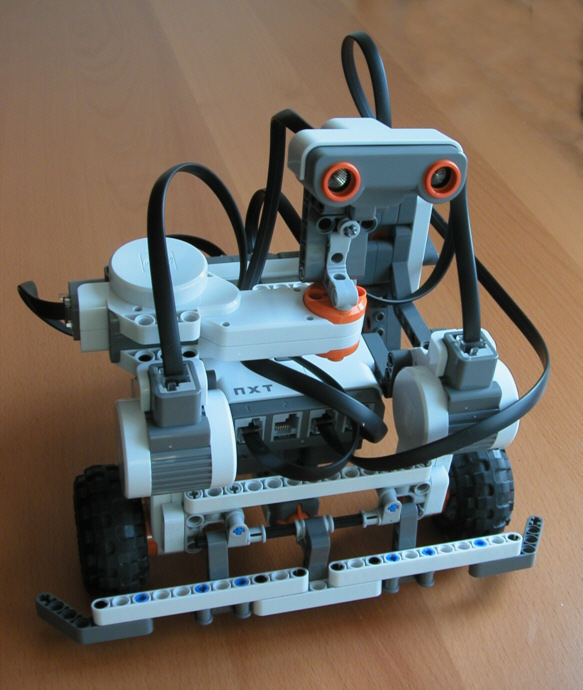 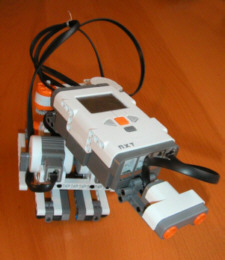 The robot should receive commands from a operator terminal via Bluetooth. 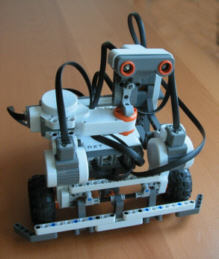 This model is a combination of mockup and functioning model: it should look like the original robot in the movie and, on the other hand, should execute a number of simple tasks. 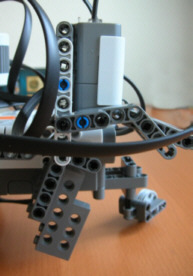 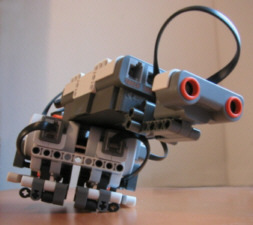 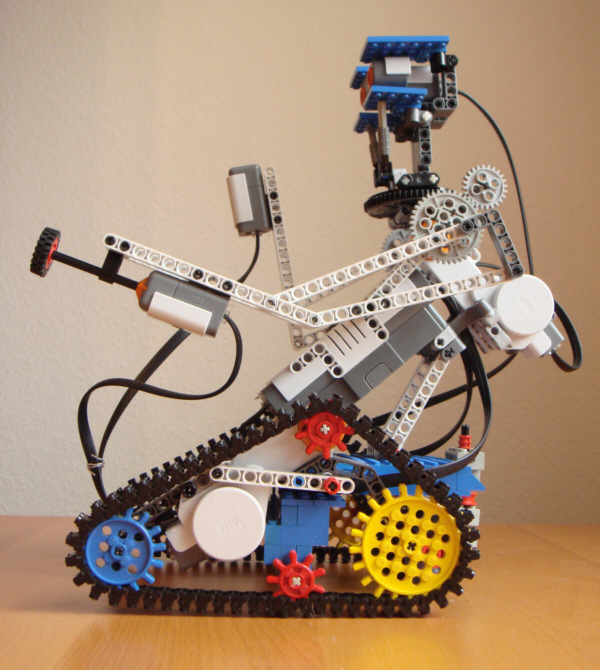 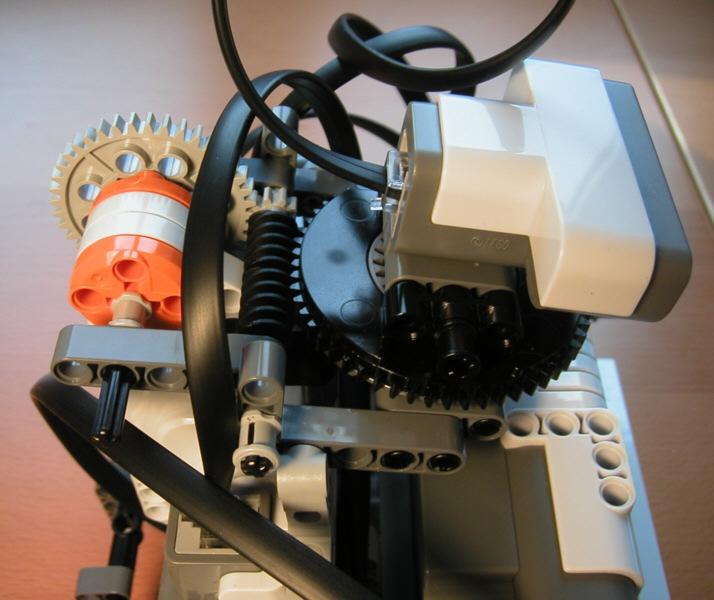 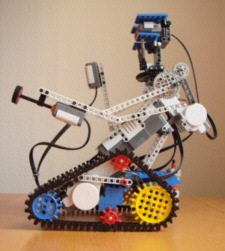 It combines Lego technics parts with the traditional lego bricks. 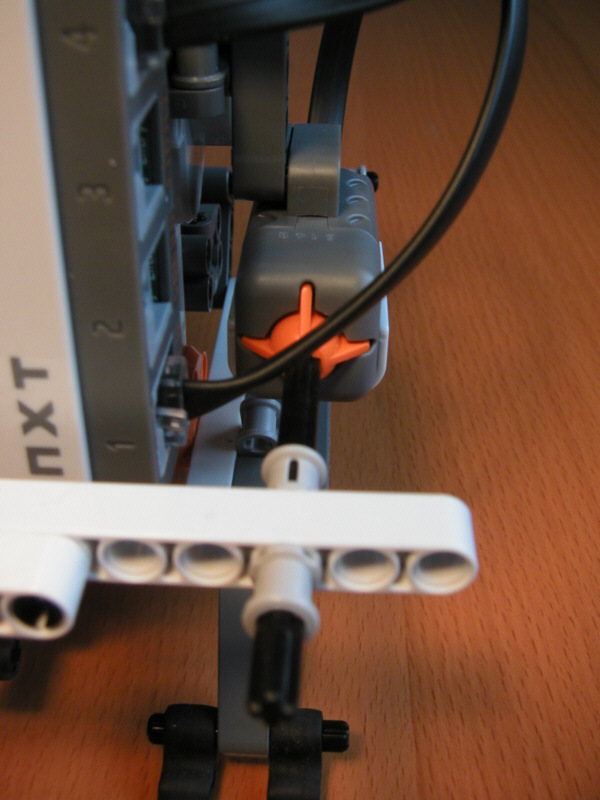 Finally, I want to discover the limitations of the LabView software development method, the potentials of the NXT approach and the mechanical restrictions of Lego construction. The turnable head shifts the center of mass. 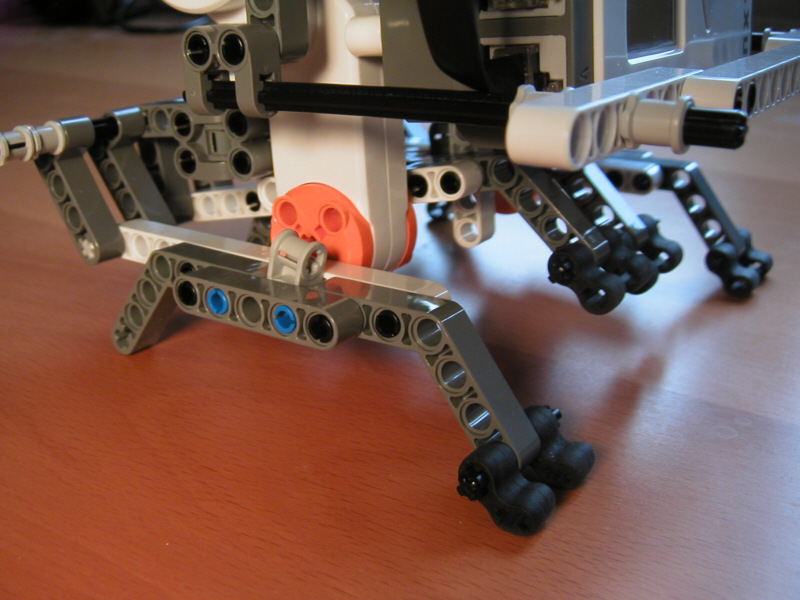 For each step, the centre of mass is moved over the supporting leg. 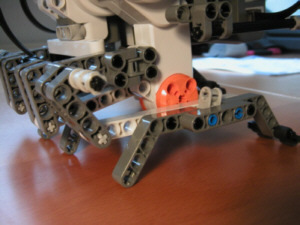 The other leg is moved forward, meanwhile the body is shifted in front of the supporting leg. After this, the head is shifted to the other side - a single step is now finished. Two motors control four legs with two skids each. 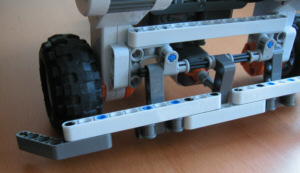 At least three skids have bottom contact. The third motor controls the head, this time via worm drive. A tactile sensor detects short range obstacles. 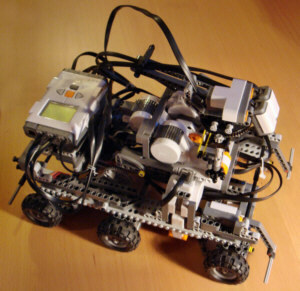 A turnable ultrasonic distance sensor detects obstacles in driving direction. 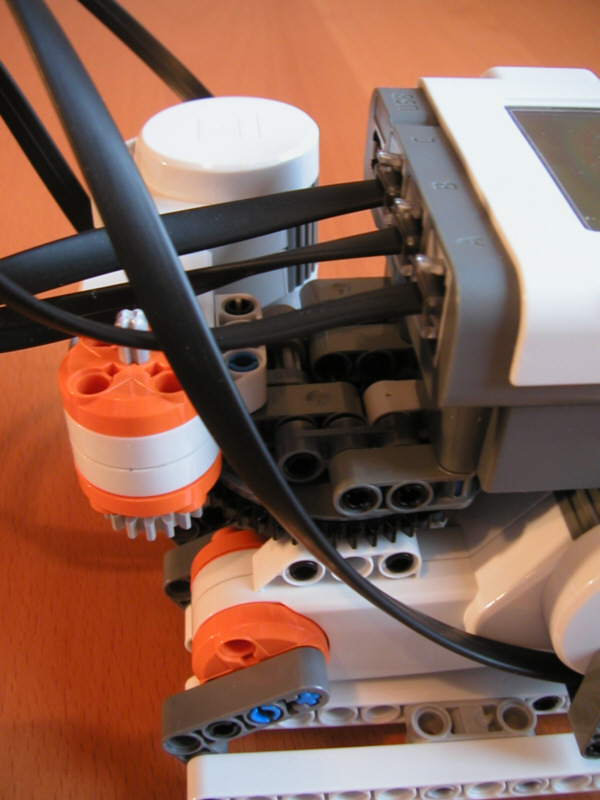 It permanently turns between +/- 45 degrees. 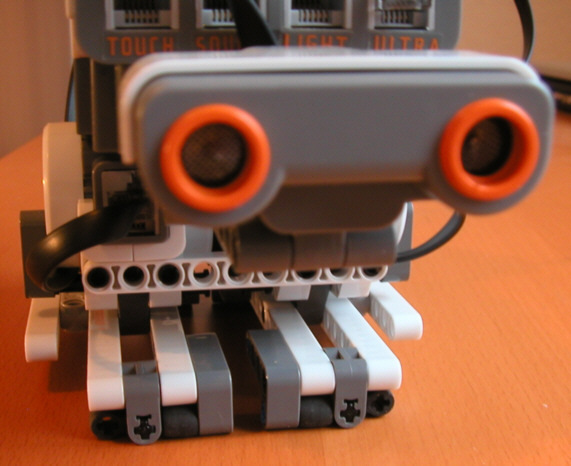 A tactile sensor at the bottom detects small obstacles that are not detected by the ultrasonic sensor. 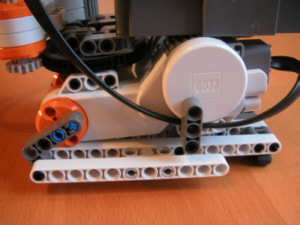 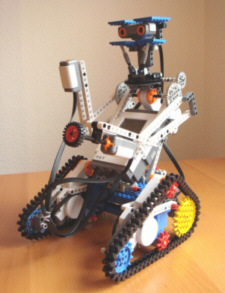 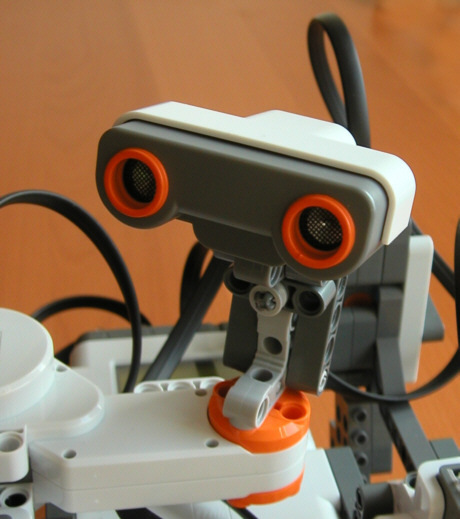 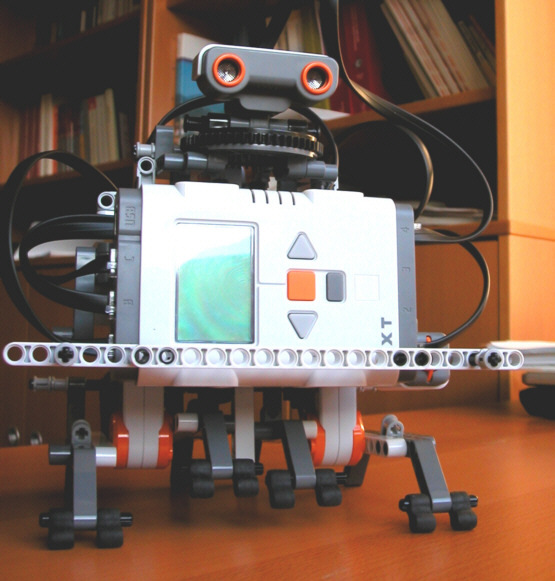 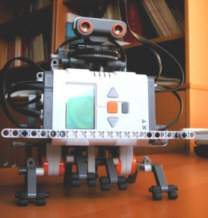 A tilt sensor supervises the robot's horizontal position.